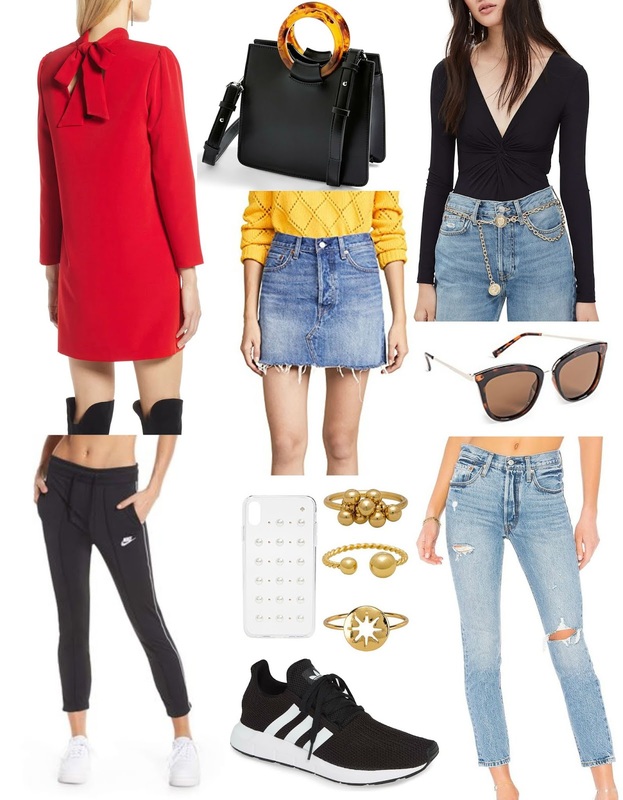 It's been a while since my last fashion finds under $100 so I thought I would share 10 great pieces in today's post! 1. Bow back dress - This is the most perfect dress for Valentine's Day! 2. Faux leather handbag - I love that this bag has both a top handle and also a shoulder strap. 3. Twist bodysuit - The front twist on this bodysuit is so chic. And the price point is under $50! 4. Denim skirt - For anyone ready to begin spring shopping, this denim skirt is a great piece to start with. 5. Sunglasses - A classic pair of cat eye sunglasses with a tortoise frame. 6. Joggers - I live for comfy joggers in the winter and these look perfect to lounge around in. 7. Phone case - A bejewelled phone case - yes, please! 8. Ring stack - This is a great ring set either to wear on one hand or on separate fingers. 9. Skinny jeans - Nothing beats a good pair of distressed Levi's. 10. Sneakers - For those that don't want overly fancy sneakers, these Adidas are minimal yet chic.